This is a support page for my WordPress plugin, WP Post to PDF Enhanced, based on WP Post to PDF by Neerav Dobaria, which renders posts & pages as downloadable PDFs for archiving and/or printing. The WordPress support page for the plugin is located here. Please note: This page refers to the 1.0.x branch of the plugin, and not the current 1.1.x branch (released April, 2015). I will be updating this page with new screenshots and updated descriptions in the near future. WP Post to PDF Enhanced is a PDF generator for WordPress posts and pages. Unlike many (most?) other plugins (such as PrintFriendly), WP Post to PDF Enhanced does not utilize any third party rendering to generate the PDF; that is to say, that it is not necessary to redirect the reader offsite to some unknown provider to convert the content. Instead, WP Post to PDF Enhanced relies on the TCPDF class to render the PDF. This makes WP Post to PDF Enhanced a completely self-contained PDF-generating plugin. This incarnation of the plugin grew out of Neerav Dobaria's initial work, and my subsequent unofficial releases through version 2.4.0. In fact, version 1.0.0 of WP Post to PDF Enhanced is functionally equivalent to my unofficial release of WP Post to PDF 2.4.0. WP Post to PDF Enhanced bears the GPLv2 license. Included works bear their own licenses. This library may include third party font files released with different licenses. All the PHP files on the fonts directory are subject to the general TCPDF license (GNU-LGPLv3), they do not contain any binary data but just a description of the general properties of a particular font. These files can be also generated on the fly using the font utilities and TCPDF methods. All the original binary TTF font files have been renamed for compatibility with TCPDF and compressed using the gzcompress PHP function that uses the ZLIB data format (.z files). These included licenses appear to be compatible - in terms of allowing bundling, at least - with the GPLv3 license which covers TCPDF (though as a disclaimer, I am not an attorney, and this does not and should not be construed as legal advice in the US or anywhere else). If installing an official version, you may do so from the normal Plugins page in your WordPress site admin area, or download the package, extract it to /wp-content/plugins/, and activate it. If upgrading from a prior release of WP Post to PDF Enhanced, no special considerations are required. I recommend upgrading through the WordPress Plugins page in your site admin area. Newer releases should be fully backward-compatible or will be able to migrate settings upon upgrading. Presently, there is no automated way of migrating options from one plugin to the other. If you have database access, before installing WP Post to PDF Enhanced, create a new row in the wp_options table. Assign a unique option_id value, set the option_name to 'wpptopdfenh', and copy the contents of the wpptopdf option_value field to the new wpptopdfenh option_value field. You may need to edit any path references referencing /wp-post-to-pdf to /wp-post-to-pdf-enhanced. If you do not have database access, note all of the options you have set for WP Post to PDF before disabling/uninstalling it, so that you may re-enter them upon activating WP Post to PDF Enhanced. Be sure to copy any custom images from the /wp-post-to-pdf paths to /wp-post-to-pdf-enhanced paths (e.g., wp-content/uploads/wp-post-to-pdf-logo.png -> wp-content/uploads/wp-post-to-pdf-enhanced-logo.png). Allowed Custom Post Types Post, Page, Attachment, or any combination where you want to be able to generate PDFs. Non Public Only Select this if you only want logged-in users to be able to generate PDFs. Only on Single Select this if you only want individual articles (posts, pages, attachments) PDF-enabled; otherwise, PDFs may be generated from, say, a page of posts. Exclude/Include Set the toggle for the list of posts/pages to specifically include or to specifically exclude (presently, there is no option for both a whitelist and a blacklist), then list the post/page IDs separated by commas. Exclude/Include from Cache Set the toggle for the list of posts/pages to specifically include or to specifically exclude from cache 1 (presently, there is no option for both a whitelist and a blacklist), then list the post/page IDs separated by commas. Before or After content, Both, Manual 2; Left, Right aligned. This can be any HTML you'd like. For the default icon, just copy the provided text. Other Plugins Select if you want (formatting) changes applied by other plugins to impact the rendering of the PDF. Process Shortcodes Select if you want shortcodes processed in the rendering of the PDF. Display Author Detail None, Username, Display Name, Nickname - sets the format (or visibility) of the author name in the PDF. Display Post Category List Select if you want to include the post's/page's category list in the PDF. Display Post Tag List Select if you want to include the post's/page's tag list in the PDF. Display Post Date Select if you want to include the post's/page's date in the PDF. Display Featured Image Select if you want to include the featured image in the header of the PDF. Image Scaling Ratio Enter desired image scaling ratio (applies to all images; default is 1.25). Note that this decimal entry refers to the relative size of the web view (the antecedent) as compared to the PDF view (the consequent, which is always 1). Header All Pages Select if you want the header information on all pages of the PDF (otherwise, this information will only appear on the first page of a multi-page PDF). Header Logo Image Select if you want a logo image displayed in the header. Replace the default placeholder image with your own, per the displayed path. Header Logo Image Factor This factor is applied to the header logo image to provide some buffer space around the image. Some experimenting may be required to get the factor just right to provide enough room around the image without abnormally expanding the overall header area (default: 14). Custom CSS Enter your desired CSS in the text box to be applied to all PDFs (hint: Firefbug or Chris Pedrick's Web Developer Extension is your friend). Check the option to apply the CSS (unchecking the option will not remove your styles from the database, so toggling and editing should be fairly easy). Header Font Select desired font for the header from the dropdown (default: Helvetica). Header Font Size Enter the size in points of the header font (default: 10). Footer Font Select desired font for the footer from the dropdown (default: Helvetica). Footer Font Size Enter the size in points of the footer font (default: 10). Content Font Select desired font for the content from the dropdown (default: Helvetica). Content Font Size Enter the size in points of the content font (default: 10). wpptopdfenh Use this within your content to generate the default PDF icon and associated link. Note that page/post exclusions do not apply to this shortcode, so even pages listed to be excluded from the "automatic" icon will display the shortcode-generated one. wpptopdfenh_break This shortcode sets a manual page break within the PDF. Presently, disabling the processing of shortcodes will render the manual page break shortcode unusable. Look for an enhancement to strip all but the above shortcodes when shortcode processing is disabled (see workaround, below). First, realize that Arial (as used in TCPDF) is not a unicode font. In fact, Arial is actually mapped to Helvietica, so if you select Arial, the actual core font you will get is Helvetica (selecting Helvetica renders exactly the same way). Next, Arial (here) is not a unicode font. Thus, if you have non-English characters, you'll need to select a unicode font in order to have them render as something other than "?" in the PDF. A good suggestion is one of the DejaVu variants. If you are finding that your images simply are not aligning as you have the img tags set, try setting the text alignment as you want the image to be aligned. For example, put a right-aligned image in a right-aligned paragraph. It's not a perfect workaround, but usually gets the job done. Expect a real fix for this in a future release. Kudos to Neerav Dobaria for his excellent work on the original plugin. Without his contribution, I would have certainly had a much harder time getting off the ground. Likewise, without Nicola Asuni's amazing work on TCPDF, WP Post to PDF Enhanced would surely look and act differently than it does now. Finally, thanks to all of the users who have posted reviews and salient comments/questions at wordpress.org for their kind words - especially to me - and suggestions for improving the functionality of WP Post to PDF Enhanced. ...and a number of other people who should likely be mentioned... Thank you all very, very much. Support may be requested either on the WordPress plugin support page or by registering for a login on this site and posting a comment to this post. I'm sorry to require registration if all you'd like to do is ask a question, but I find that it's the best way to curtail comment spam. I promise that I won't utilize your email address or other requested information for any purpose other than identifying you on this site, nor will I ever sell or otherwise knowingly disclose your information to any third party without a court order. If you would like to contribute something monetarily, you have my thanks, and I will be sure to see that some portion of your donation gets to Nicola Asuni's TCPDF project. Also, please consider contacting me with some IT consulting issue or even about web hosting (Rosenthal & Rosenthal's hosting fees are quite reasonable, as are our domain registration fees). Alternatively, contribute something to Warpstock either directly or via an Amazon purchase, or consider giving to your local Humane Society or some legitimate organization which provides support for America's troops and/or veterans (or to such an organization for one of our allies). In truth, there is no amount which can ever repay those who fight - and who have fought - for Freedom. And thsi within the theme template of the site: ERROR: Template not found. List of active plugins: All except article2pdf. Hope the fix isn't too hard to figure out! Thanks! Hi, and sorry to hear of your issue. If you haven’t tested already, please follow the directions here to download the latest development release. I really am close to releasing 1.1.0, but still have a few nits to pick. I do believe that I’ve addresses the “headers already sent” issue as well as the others with the update to the TCPDF class included in the development build. Please let me know how this works for you. Good luck! Witch font can I use for non english website? I tryed all DejaVu and is not working. I miss some characters. My site is text/html; charset=UTF-8, and use Croatian language. Can I install new font that is UTF-8? I do not have Arial unicode listed, so I can not try. Sorry to hear of your trouble, Antun. You don’t mention whether you are using the development version of the plugin or the latest release version. I would suggest trying the development version, by following the instructions outlined here. DejaVu fonts have tested well in the past, but admittedly, I can’t recall testing Croation. It looks like it’s telling you the truth: It can’t open a temporary file for writing. This is usually caused by alck of permission to write to the directory. Please check permissions and ensure thI see youat the web user (the user running the web server) has permission to write to wp-content/plugins/wp-post-to-pdf-enhanced/tcpdf/cache/ . Hi Lewis, 2 issues: 1) I replaced the default logo and now nothing is showing, although it looks like the header layout has changed to accomodate the logo. http://visiblybetter.net/wp-content/uploads/wp-post-to-pdf-enhanced-logo.png 2) The featured image is very pixelated – it's pulling in something very small for some reason so when I blow it up to fill the page width it looks very poor quality even though the original is quite decent. The original post I'm pulling in is here: http://visiblybetter.net/winning-more-business-from-trade-shows-and-exhibitions?format=pdf Thanks for any help you can give. All image processing is done by the TCPDF class, which I don't maintain, so there's not much I can do to fix rendering issues. I can tell you that there are known limitations with PNG images with alpha channels "disappearing," though. You might want to check in with the TCPDF maintainer and see if he has any further suggestions (http://www.tcpdf.org). We are due for an update of the TCPDF class in WP Post to PDF Enhanced. I just need soem time to make that happen (I tried a quick hack, and that didn't work as expected, so it will require a little more investigation). As for the other image rendering issue, again, that would likely be as a result of TCPDF's interpretation of the image. I'm not sure what to suggest from here. I'm trying to figure out why the post content is not redered by the plugin. 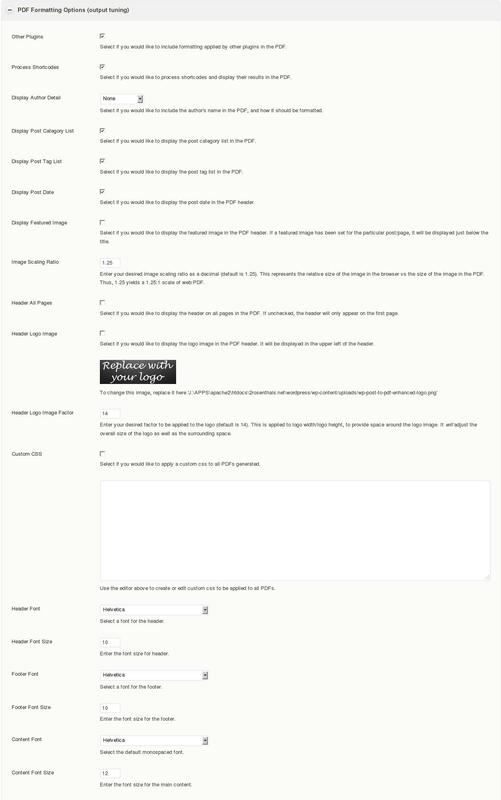 I'm using a content template created by the Toolset Types plugin that creates custom content and displays on the page when the wp function 'the_content' is called. I've seen that the plugin uses 'the_content' function to retrieve the post content, so I don't know why I'm only getting the post title but not the content in the PDF. Any ideas? Honestly, I have no idea, other than to say that (obviously) by the time we get the content to render, it has already been intercepted and handled by something else. I assume you have checked the General option to handle output from Other plugins. This is a very old option (taken from the original Post to PDF plugin before I forked it). It may be that the logic is no longer valid (I haven’t looked at this code in some time). I’ll add this to my list. No idea when or if I’ll have a chance to look at this, but you never know. Sorry it’s not working as it should! I want to see how many people are actually downloading the PDF files and thought to manually include an event for Google Analytics using the "onclick" parameter. Can you tell me which file and part of the code should I edit in the plugin in order to accomplish this? Is there another way you can recommend? I'm using the latest version of your plugin. Honestly, I have no clue. I’ll add this to my internal list of requested features, and perhaps I’ll add a setting for it. Personally, I dislike Google technologies and try to avoid them whenever possible. However, I realize that I am in the minority in this regard and that others may want to pass information to Google for analytics and such. Yours should hardly be an unique request. Sorry I don’t have a suggestion for you, and thanks for your kind words. The plugin is due for some sprucing up, if only I could find the time.